Charge and Sync 32 tablets at the same time. Transport tablets easily from room to room. Charge a mix of tablets, with or without covers. 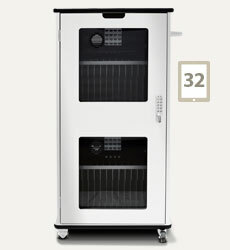 The smallest 32-bay charging trolley on the market. 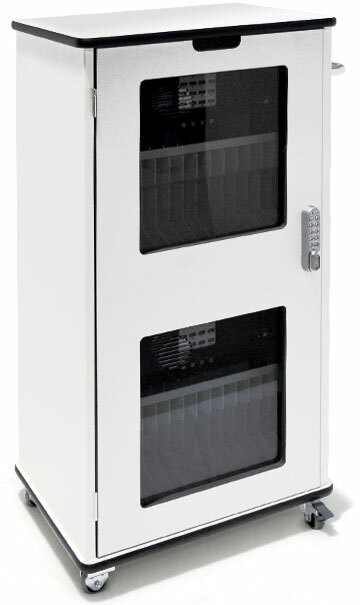 Ideal for use in schools, hospitals and more. 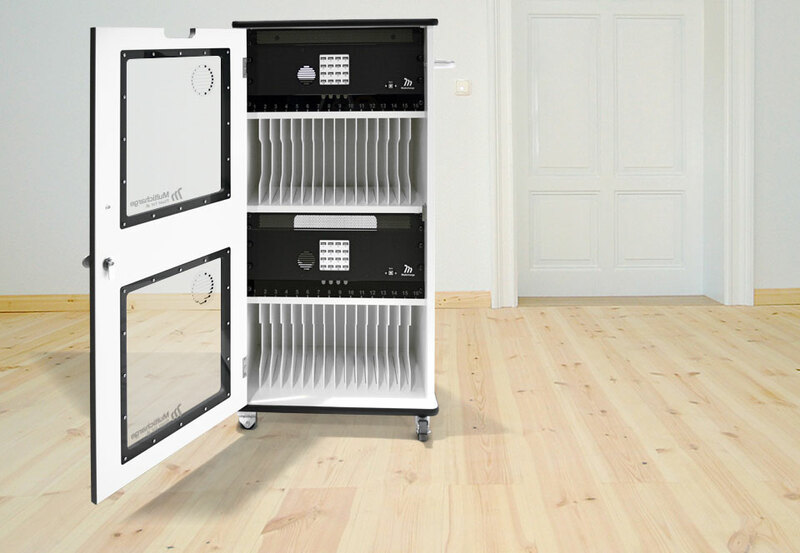 Say hello to the Swiss Charge & Sync Trolley from Multicharge - the smallest 32-tablet charging trolley on the market. Charge up to 32 tablets quickly and easily. 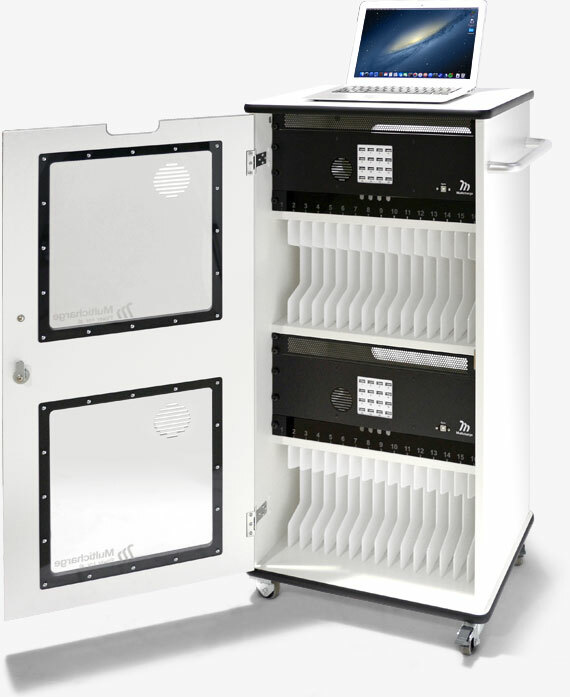 With intelligent Cambrionix technology, all 32 tablets can be charged in roughly the same time as it would take to charge one. 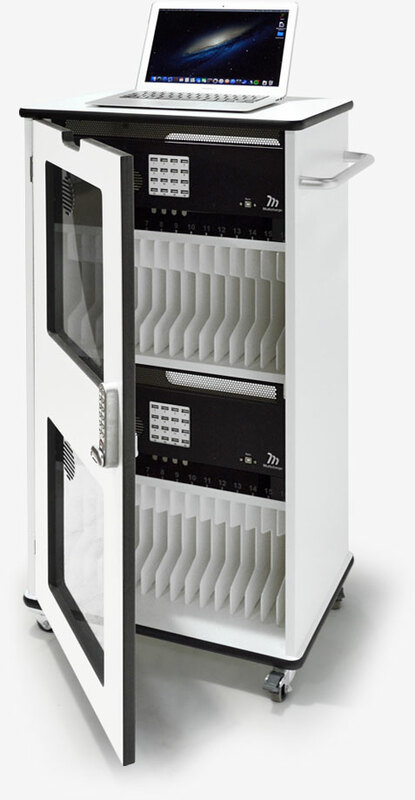 The trolley is suitable for any USB-chargeable tablet up to 10 inches in size, so whether you have 32 iPads or a mix of different tablets (including Google Nexus, Amazon Kindle Fire, Samsung Galaxy and Microsoft Surface) you can charge them all at once, with maximum charging power delivered to each device. Syncing is also easy for tablets of the same make and can be carried out while charging is taking place. 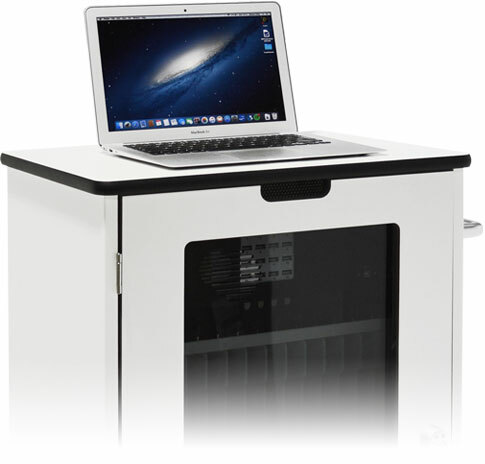 Simply hook up your Mac or PC to the trolley and open Apple Configurator, iTunes or any other syncing software to share ebooks, podcasts, videos and more. The simple way to manage content across multiple tablets. 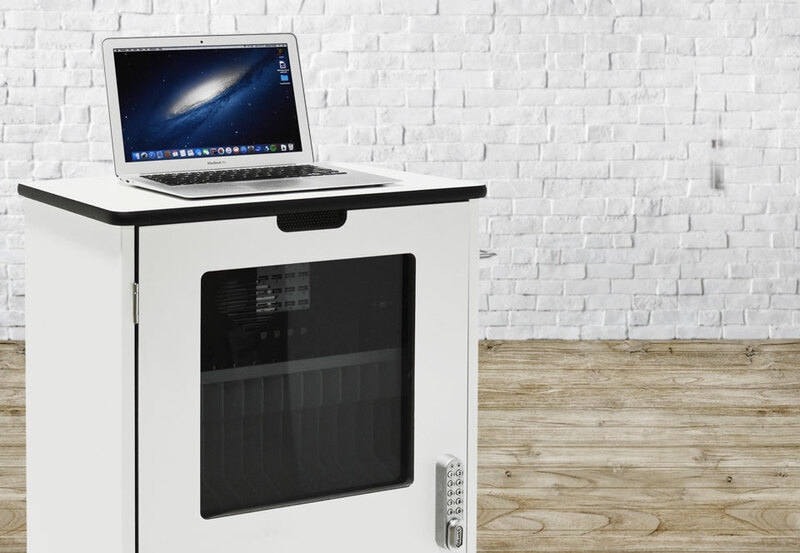 Designed and manufactured in the UK with a stylish exterior and uniform material inside and out, the sleek, unobtrusive trolley complements the fittings and furniture of almost any working environment. 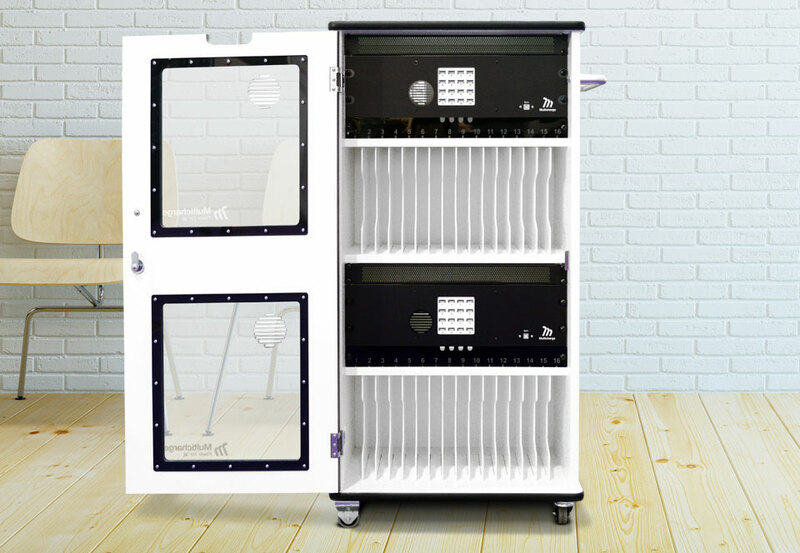 It's also the smallest 32-bay charging trolley currently on the market with a minimal footprint, making it ideal for schools and hospitals. The trolley arrives fully assembled - just insert and connect your tablets, plug in to a power socket, and you're ready to go. 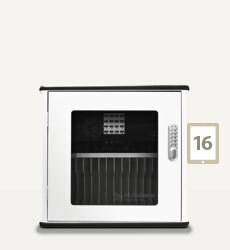 The 180° fold-back door offers maximum access when you need it, and you can charge devices with the door open or shut. It's even suitable to be left on overnight so you can charge and sync ready for the day ahead. 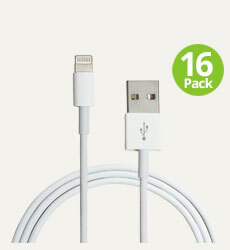 Purchase a pack of 16 lightning-to-USB charging cables from Multicharge at the same time as your Multicharge trolley, and we will fit the cables for you, free of charge. 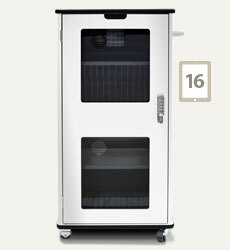 The Swiss trolley was designed for use in busy and varied locations. 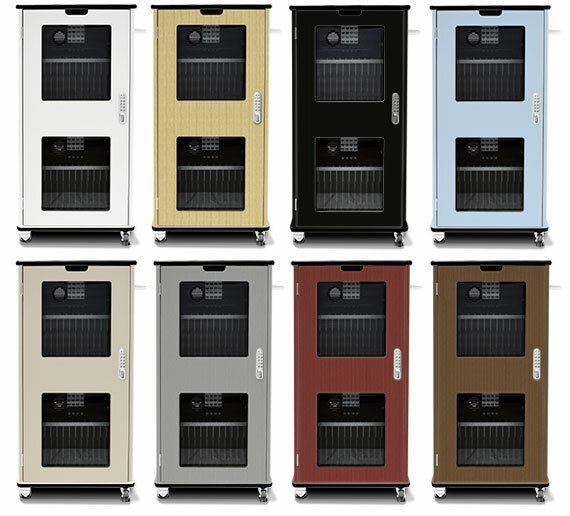 Schools, hospitals, hotels, retail stores, restaurants, and more. 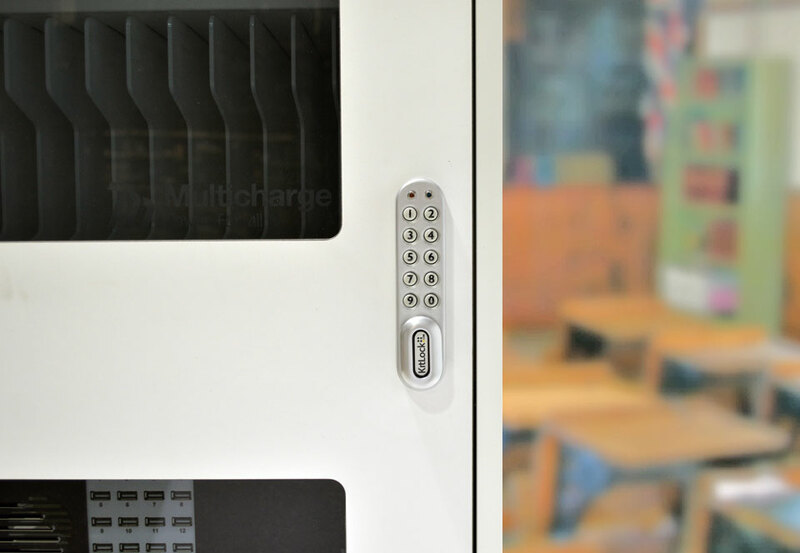 In environments such as these, security is important. 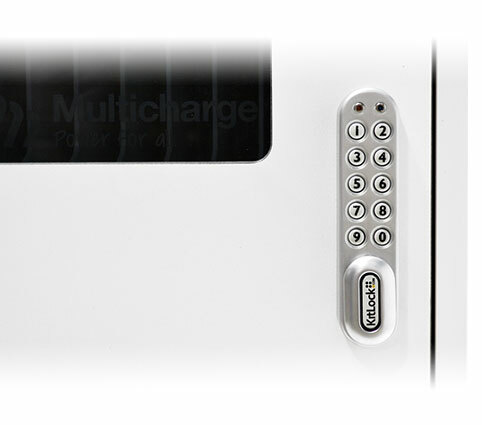 That's why every Multicharge Trolley comes fitted with a digital lock, helping to keep your tablets safe and secure, even while charging. For even more security, the trolley can be bolted or chained to a wall. 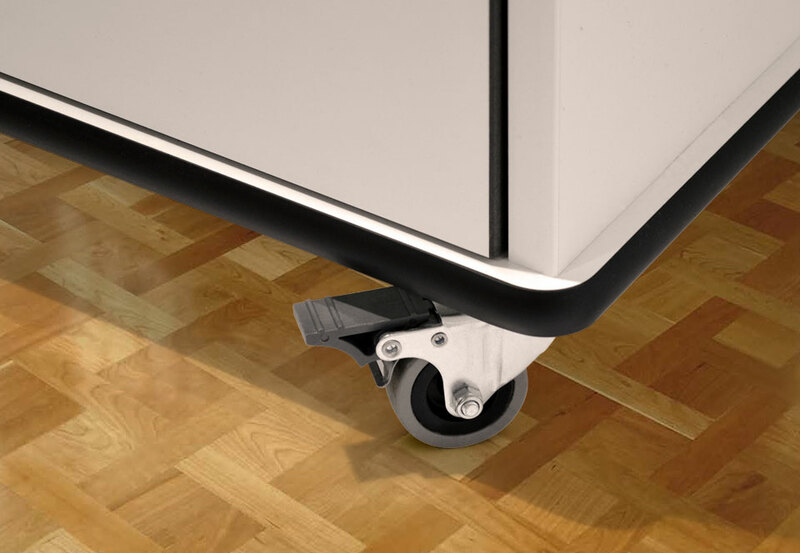 With swivel and braked non-marking wheels, a chunky aluminium handle and strong but lightweight construction, moving multiple tablets from room to room is a breeze. What's more, there's no need to drag around a clunky power brick, because unlike other charging trolleys, we've already thought of that, ensuring everything works from a single power cord. 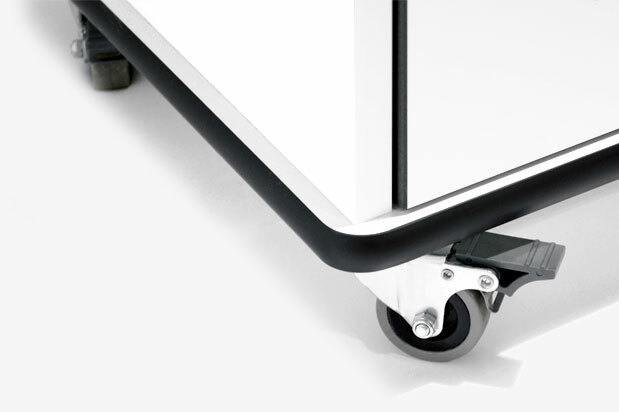 By default the trolley comes in beautiful white, however it can be supplied in a range of colours and wood-grain finishes too. It can even be customised with graphics with a vinyl wrapping, so if you are looking to promote your brand identity with a logo and graphics, or maybe you just need to add some text, the Swiss Trolley from Multicharge can adapt to your needs.